Here's my Survivor LO. This is a photo of my youngest DD and the journalling is about the fact that she is always trying to keep up with her sisters! TFL! Oh, I really like this. How cute are those buttons down the bottom. What is that journalling block from? I love it. The birds and the lace are lovely touches..great work doing all that journalling! Del she is just gorgeous and I adore what you have done with this LO... everything is perfect! Love the lace, lace pp, and scalloped pp. Lovely! Great LO - I used the same Patterned paper, it is so nice to work with and you have done a fantastic job. I love it.. this is a beautiful layout. Del's mojo is back Gorgeous LO! What great work. A lot of thought and effort has gone into your layout. Congratulations its beautiful. Fabulous as always Del. Love the birds. She is so grown up looking now. Wow, everything about this is just wonderful. So beautiful and great journalling too. 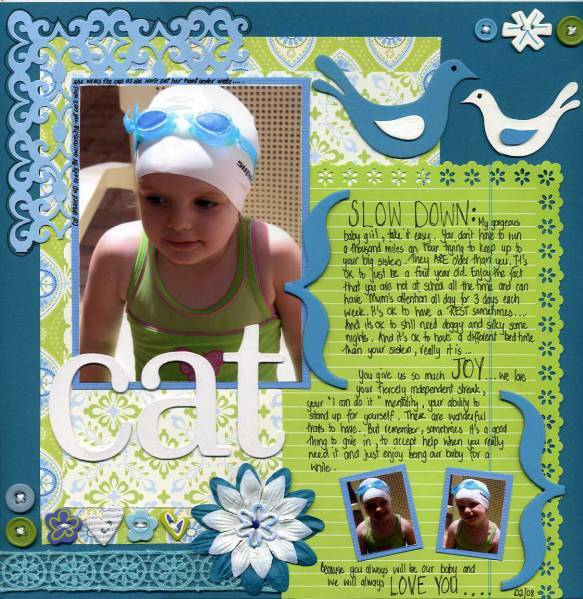 I love the journalling - this looks great, it's a little "busy" but still totally balanced. LOVE it! This is superb, Del.I love the softness you've achieved with all the lacy parts and it's a great design too.